The statue of John Colet, the founder of one of the top schools in the UK, St Pauls in London, was made by Sir Hamo Thorneycroft, RA (1805-1925), who’s other work includes the statue of Oliver Cromwell outside the Houses of Parliament. John Colet was Dean of St Pauls from 1505 until his death in 1519. He inherited great wealth from his father, Sir Henry Colet, Mercer and Lord Mayor of London, and was thus able to endow the school. Mr Edward Howley Palmer, a Director of the Bank of England and Governor of the school, gave The Colet Statue to the school and it was unveiled in 1902. It is made of brass and was cast in Frome Somerset. In celebration of the statues centenary, old Pauline’s Richard and Tim Cunis generously commissioned Eric and his wife Jennifer to gild in 24 carat gold leaf the lettering and six angels; three with trumpets and three with scrolls, signifying the Gospel. John Colet dedicated his school to ‘Christ Jesus in his boyhood and his blessed Mother Mary’ and they are enthroned on the top. It took three months to complete the guilding. 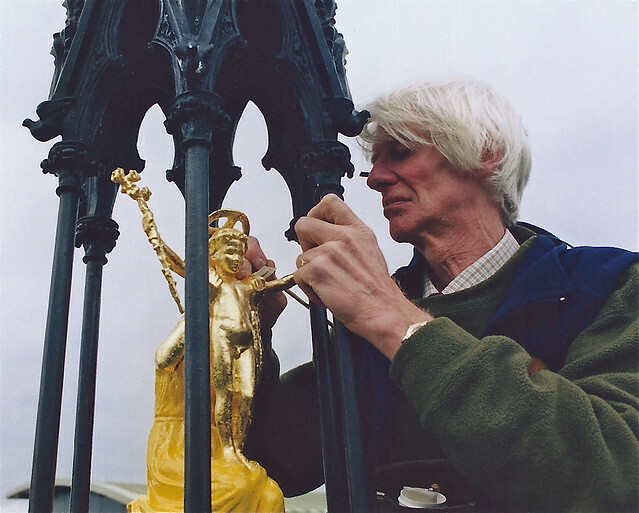 Rob March, who is the senior lighting co-ordinator at The Royal Opera House, Covent Garden, had assisted with the illumination of the statue so that at night it can be seen in all its refurbished splendour. It stands outside the Rackets Courts as you drive up the drive into the main school entrance and stands at 10 meters high.